Sometimes when you're far away from home, all you can think about are the pets you left behind. And this little squirrel seems to feel the same way. According to a video posted a few years ago, this particular squirrel was a former pet who reentered the wild once he reached adulthood. However, he still pops in to visit from time to time — and can't get enough of his onetime friend, the cat. He's beyond excited to see his former roommate, jumping and pouncing on him and rolling around in his fur — and the cat doesn't seem too bothered by it either. This little guy's backstory isn't clear, but it's generally inadvisable to keep a squirrel as a pet (after all, you wouldn't want him to think all cats are this friendly) — though he seems to be doing OK. 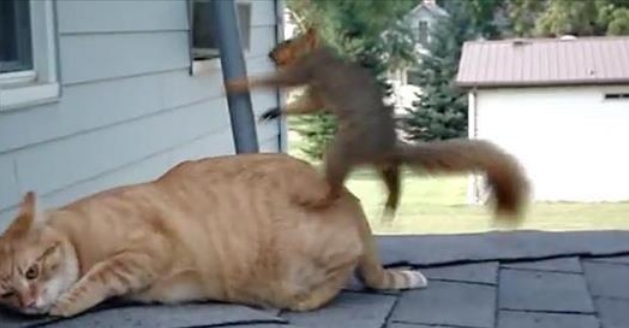 Responses to "Squirrel Pops By To Visit His Best Friend — The Cat "